Dr. Nate Bosch, far right, director of the Center for Lakes and Streams at Grace College, addresses Wawasee High School honors biology students, from left, Cayden Wegener, Adrienne Gill and Kabrea Rostochak at Lake Wawasee. Wawasee High School honors biology students from Pam Schumm’s classes (a total of 50 from two classes) went on a field trip Thursday to Lake Wawasee as part of their ecology unit. Dr. Nate Bosch, director of the Center for Lakes and Streams at Grace College, Schumm and her students and the volunteer boat captains met at the Wawasee Boat Company, which allows the use of its restroom and parking facilities and volunteers a few boats for use. 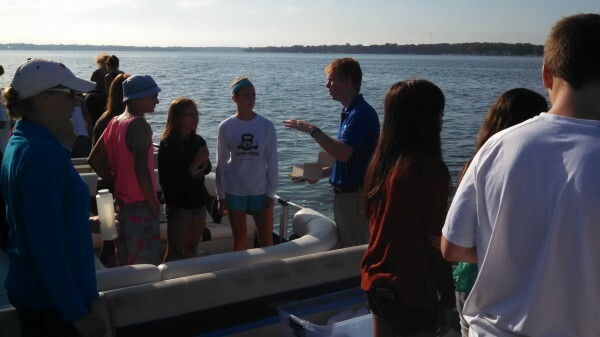 Students were then taken out in about eight pontoons to the deepest spot on Lake Wawasee, where they connect the pontoons to create their own “barge” for lake sampling. Bosch led the students through a hands-on aquatic ecology lesson. He reviewed the equipment with the students, such as a Secchi disc for measuring water quality, an Ekman dredge for collecting sediment samples from the lake bottom, a Van Dorn sampler for collecting water samples at different depths from the lake surface to bottom and chemistry test kits to test for phosphorus, nitrogen, pH and other parameters. Bosch also taught the students about aquatic ecology concepts like the food chain and lake mixing. He then allowed the students to use the equipment to test some of those concepts themselves, such as taking water samples at the top and bottom of the lake and comparing them to see if the lake is mixing. After Bosch’s part of the day was done, the students went out on the lake one more time to do an aquatic plant survey. They raked out aquatic plants from different locations around the lake and compared them. Funding from the Kosciusko County Community Foundation made the lake field trip possible.